It’s not a new concept to focus on because there are thousands of tutorials stating the necessity of keeping your WordPress website updated. 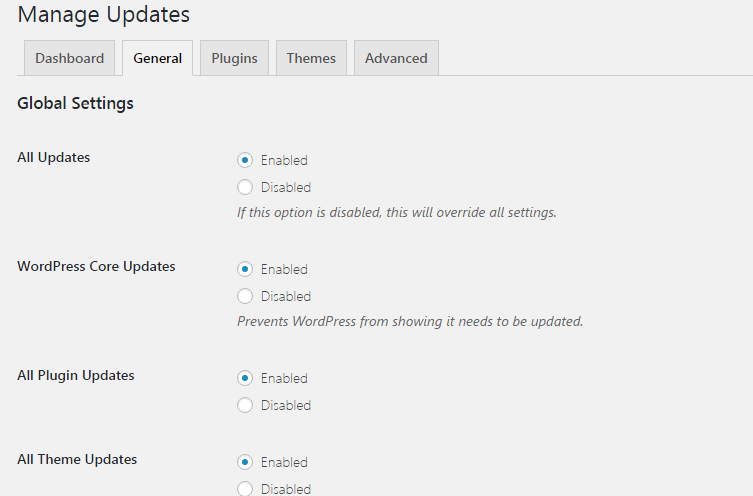 You can enable automatic updates for WordPress plugins and themes. But have you ever thought to manage automatic WordPress updates properly with one tool? You can add different codes for the plugins and themes automatic updates but wouldn’t it be great if you can handle all the updates at once. In this tutorial, you will learn the easiest way to manage it all. With the use of one line of the WordPress codes, you can enable and disable the automatic updates for plugins and themes. But many people feel overwhelmed due to the techie stuff. They require to having something which is easy to configure. Though the urge of having a clean and updated WordPress blog leads its users to take some essential steps. There are many plugins which get updates weekly or monthly. For such plugins, people like to enable automatic updates because of getting rid of some manual work. For some people who aren’t able to manage their WordPress blog regularly, it’s really helpful. But not all plugins need automatic updates because a major plugin update can break your website. So it’s always recommended to enable only security and bug fix updates. Just like any other WordPress plugin, you have to install and activate Easy Update Manager. After installation, you have to visit its settings’ page to configure it. Step 1:- Go to Dashboard>>Updates Options and you will see many automatic update options. These are some options you can use. This page provides you the quick access to enable and disable the automatic updates for the plugins and themes. It shows all the options you will use in the different tabs. Step 2:- There are many tabs for different settings. Now, you have to do some general WordPress core and plugin settings. Open the General tab and many options will be showing. This page let you manage the minor and major updates for WordPress core, plugins, and themes. It’s always recommended to enable only minor updates. To enable automatic updates in WordPress only for big release, you can use the simple code editing method. Do the settings and save it. Step 3:- Click on the Plugins tab and you will see all the plugins you have in your WordPress admin panel. It includes activated and deactivated plugins too. Under every plugin, you will see an option to allow updates or disallow updates. It’s useful because you can enable automatic updates only for selected plugins. It’s always recommended to use it for the regularly updating plugins. Step 4:- Just like plugins, you can manage it to the themes. You don’t need to do it for all. Though it’s always recommended not to install extra themes but still if you have, you can use this plugin. Some people have a child theme and the parent theme and don’t want to lose the customization. So it can be useful for them. Allow or disallow for the themes and save the settings. Step 5:- The best thing about this plugin is the Advanced tab. It gives you the freedom to choose the users who can update WordPress their own. For multi-author websites, it’s one of the best options to use. You can also reset all the settings to default from this page. There are few more options to explore. After all the settings, you have accomplished your task to manage automatic WordPress updates properly. You can change the settings anytime you want. NOTE : Many people would want to downgrade a WordPress plugin after an unexpected automatic update. You can just roll it back within a few seconds. It’s the question of your website’s security and you should take it seriously. Keeping your WordPress website updated is the positive sign of being healthy. Sometimes, WordPress seems to be a very tricky platform to get pace with. But there is always a solution. Isn’t that easy to manage automatic WordPress updates properly? If you still have any doubt, you can share your thought in the comment section. How To Create Navigation menu In WordPress Theme Within A Minute? Good post here, I havent done any auto updates for my plugins or themes in wordpress yet. I do it manually, and I think this makes sense. I shall definitely try out. You have done a good job in explaining the features well. If you’re a regular WordPress user then it’s always good to update your plugins and theme manually. Automatic updates are for the people don’t get enough time to keep their website updated. In my case, I occasionally do automatic updates, especially with plugins. In some instance, this could lead to broke a site when an unprecedented event happens. It’s the matter of choice. But I would recommend to do it your own. Manual work is always the best. Though you can handle the automatic updates but still, think before you activate.